The Miami Hurricanes powered past the over-matched and under-manned FAU Owls 75-55 in Coral Gables on Saturday. 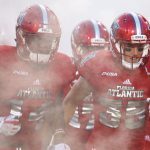 The Owls trailed by 17 in the game’s first 11 minutes and saw the Hurricanes double their score, 46-23, by halftime. “I wish we could have gotten off to a better start and given our young guys some confidence to hang around and see what would happen, but I thought Miami played very physical and aggressively,” FAU coach Dusty May said. Playing without leading scorer Jailyn Ingram (season-ending ACL tear) and Xavier Stapleton (knee), any thought of a second-half comeback quickly vanished when the Owls went scoreless from the field during the first six minutes of the second half. FAU trailed by as many as 32 points, before closing the game on a 19-9 run. Jaylen Sebree scored 11 of his 18 points during that run. Moving Forward: Guard Anthony Adger’s 19 points tied for a game high. …Reserve guard Michael Forrest tallied five assists. …Simeon Lepichev led the Owls with seven rebounds. Falling Backward: Starting guard Richardson Maitre failed to score, missing all four of his shots. …Center Karlis Silins started the game but only played six minutes and failed to score. 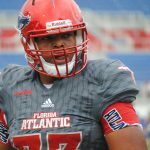 A deep bruise kept him out of the Owls’ previous game, a victory over Florida College. …FAU allowed Miami to make 50.9 percent of its first-half shots. Key Stat: 34 – points in the paint scored by Miami. FAU managed only 20. Up Next: The Owls travel to Illinois on Saturday for 3 p.m. tip-off.